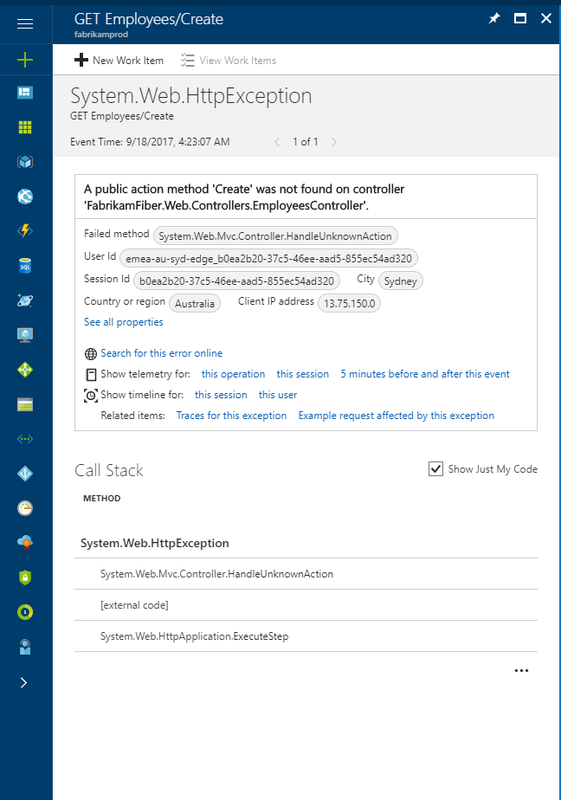 Exceptions in your live web app are reported by Application Insights. You can correlate failed requests with exceptions and other events at both the client and server, so that you can quickly diagnose the causes. Open the app solution in Visual Studio to help with debugging. Run the app, either on your server or on your development machine by using F5. 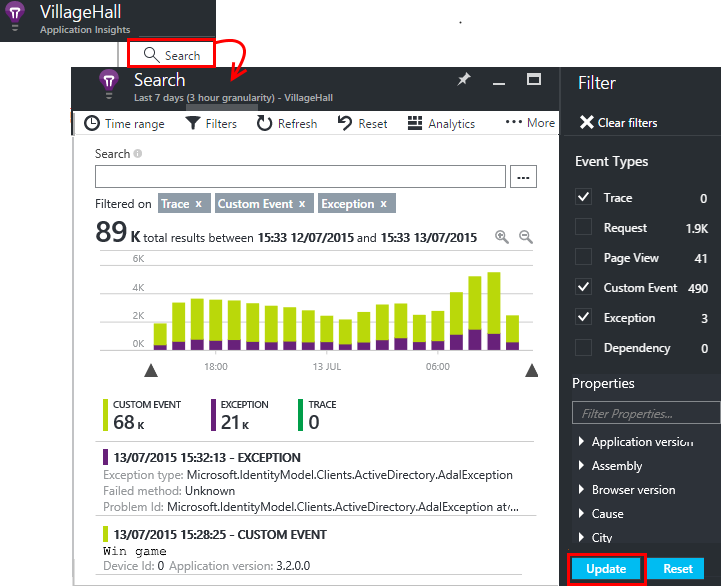 Open the Application Insights Search window in Visual Studio, and set it to display events from your app. While you're debugging, you can do this just by clicking the Application Insights button. Notice that you can filter the report to show just exceptions. No exceptions showing? See Capture exceptions. Click an exception report to show its stack trace. Click a line reference in the stack trace, to open the relevant code file. 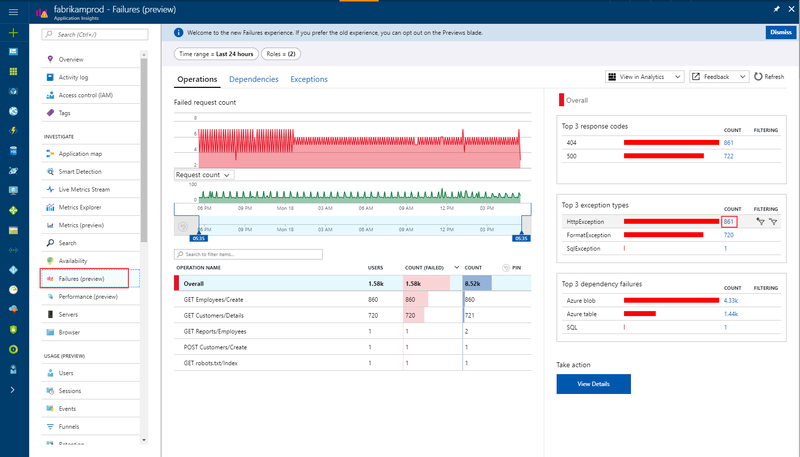 Application Insights comes with a curated APM experience to help you diagnose failures in your monitored applications. To start, click on the Failures option in the Application Insights resource menu located in the Investigate section. You should see a full-screen view that shows you the failure rate trends for your requests, how many of them are failing, and how many users are impacted. On the right you'll see some of the most useful distributions specific to the selected failing operation, including top 3 response codes, top 3 exception types, and top 3 failing dependency types. Here you can see all the exceptions collected for your monitored app. To get diagnostic data specific to your app, you can insert code to send your own telemetry data. This displayed in diagnostic search alongside the request, page view and other automatically-collected data. TrackEvent() is typically used for monitoring usage patterns, but the data it sends also appears under Custom Events in diagnostic search. Events are named, and can carry string properties and numeric metrics on which you can filter your diagnostic searches. TrackTrace() lets you send longer data such as POST information. TrackException() sends stack traces. More about exceptions. If you already use a logging framework like Log4Net or NLog, you can capture those logs and see them in diagnostic search alongside request and exception data. To see these events, open Search, open Filter, and then choose Custom Event, Trace, or Exception. If your app generates a lot of telemetry, the adaptive sampling module will automatically reduce the volume that is sent to the portal by sending only a representative fraction of events. Events that are part of the same operation will be selected or deselected as a group, so that you can navigate between related events. Learn about sampling. Install the SDK in your application project. Insert code in your application to call Microsoft.ApplicationInsights.TrackTrace(). Send the POST data in the message parameter. There is a limit to the permitted size, so you should try to send just the essential data. When you investigate a failed request, find the associated traces. Log exceptions explicitly by inserting code in exception handlers to report the exceptions. Capture exceptions automatically by configuring your ASP.NET framework. The necessary additions are different for different types of framework. The simplest way is to insert a call to TrackException() in an exception handler. The properties and measurements parameters are optional, but are useful for filtering and adding extra information. For example, if you have an app that can run several games, you could find all the exception reports related to a particular game. You can add as many items as you like to each dictionary. Most browser exceptions are reported. For web forms, the HTTP Module will be able to collect the exceptions when there are no redirects configured with CustomErrors. Starting with Application Insights Web SDK version 2.6 (beta3 and later), Application Insights collects unhandled exceptions thrown in the MVC 5+ controllers methods automatically. If you have previously added a custom handler to track such exceptions (as described in following examples), you may remove it to prevent double tracking of exceptions. Exceptions thrown from controller constructors. Exceptions thrown from message handlers. Exceptions thrown during response content serialization. Exception thrown during application start-up. Exception thrown in background tasks. All exceptions handled by application still need to be tracked manually. Unhandled exceptions originating from controllers typically result in 500 "Internal Server Error" response. If such response is manually constructed as a result of handled exception (or no exception at all) it is tracked in corresponding request telemetry with ResultCode 500, however Application Insights SDK is unable to track corresponding exception. 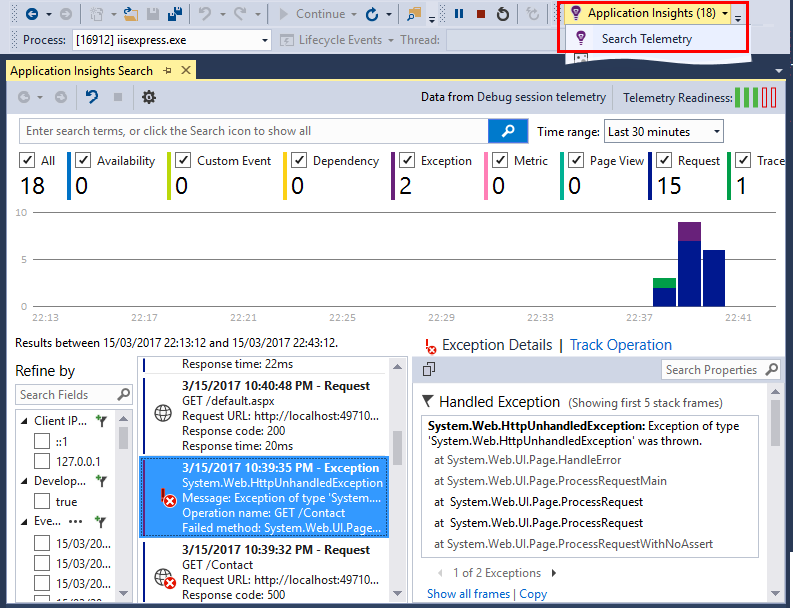 If you use MVC 4 (and prior) of Application Insights Web SDK 2.5 (and prior), refer to the following examples to track exceptions. Replace the HandleError attribute with your new attribute in your controllers. 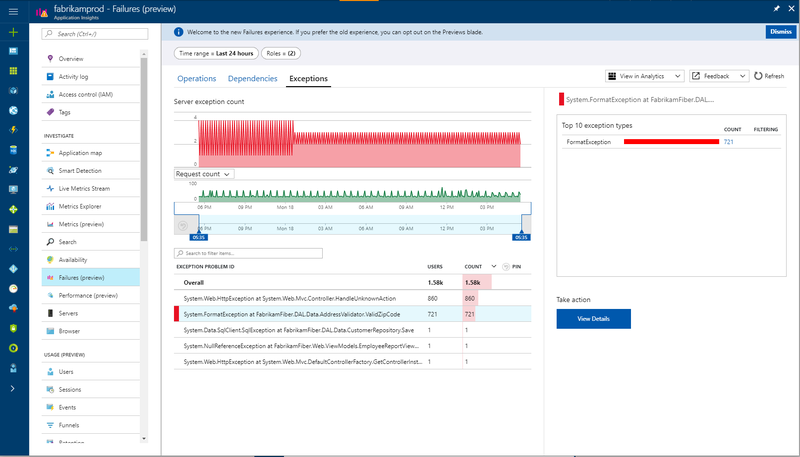 Starting with Application Insights Web SDK version 2.6 (beta3 and later), Application Insights collects unhandled exceptions thrown in the controller methods automatically for WebAPI 2+. If you have previously added a custom handler to track such exceptions (as described in following examples), you may remove it to prevent double tracking of exceptions. All exceptions handled by application still need to be tracked manually. Unhandled exceptions originating from controllers typically result in 500 "Internal Server Error" response. If such response is manually constructed as a result of handled exception (or no exception at all) it is tracked in a corresponding request telemetry with ResultCode 500, however Application Insights SDK is unable to track corresponding exception. If you use WebAPI 1 (and prior) of Application Insights Web SDK 2.5 (and prior), refer to the following examples to track exceptions. Exception Filters (as described in the section on Web API 1.x controllers above) - not called in all cases. Add a class that extends Attribute and implements IErrorHandler and IServiceBehavior. If you have installed the Application Insights Agent on your server, you can get a chart of the exceptions rate, measured by .NET. This includes both handled and unhandled .NET exceptions. Open a Metric Explorer blade, add a new chart, and select Exception rate, listed under Performance Counters. The .NET framework calculates the rate by counting the number of exceptions in an interval and dividing by the length of the interval. This is different from the 'Exceptions' count calculated by the Application Insights portal counting TrackException reports. The sampling intervals are different, and the SDK doesn't send TrackException reports for all handled and unhandled exceptions.